Stepladder Zil-4331 L-rear spring 545mm. Stepladder Zil-back spring 130 L-480mm. It springs front ends are fixed ears and fingers on the frame brackets. Eyelet installed in a spring attached through the spacers by means of bolts 2 and ladders of the spring displacement is restrained by means of the projections on the crank piece with the gasket. The ear pressed into the hub of the highly wear-resistant materials. Rear springs are based on crackers brackets and have the ability to move them when the deflection springs. At crumbs fingers are inserts that protect against wear and wall brackets are tightened with bolts, which are the hub. With indigenous leaf sliding side mounted cover, which protects it from wear. All are subject to friction parts undergo heat treatment in order to increase their service life. Middle spring is fixed to the pads by means of the front axle 2 with overlays ladders. On the cover and pillow front axle have locks that prevent longitudinal shift springs. 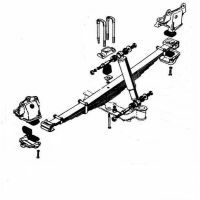 The suspension give two telescopic hydraulic shock-absorbers 2nd action spring fixed to the top frame bracket and the bottom of the front axle. Vertical movement limited buffers, soothing strokes. Includes the primary and secondary springs. Closure with the rear main spring made with same type fasteners as well as in front. Additional spring has no connection with the frame - it can lurches as a unit with the base by means of the same ladders, and comes into operation at the time of the full load on the vehicle, based on a special frame brackets .